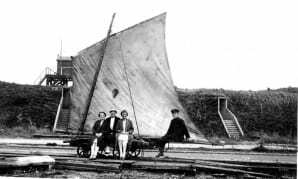 AS PART of the programme to celebrate the opening of the newly refurbished Spurn Lighthouse in Yorkshire, the Yorkshire Wildlife Trust (YWT) is hoping to build a replica ‘Spurn sail bogie’. This unusual type of transport was used on the Spurn military railway between the two wars. To enable this to happen, the YWT is seeking two pairs of standard gauge wheels, about 12-18 inches diameter on axles. Many people will be familiar with this type of spoked wheel from platelayers’ trolleys, timber bogies, or from on-track trolleys used for conveying small components. If anybody or any organisation has a spare set of such wheels, could they contact Phil Mathison, e-mail philgoudie@hotmail.com. Any assistance in this matter is much appreciated.